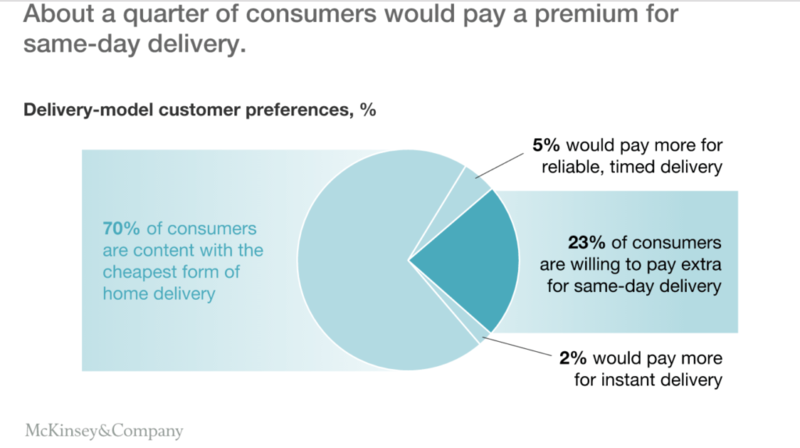 Recently, McKinsey published an incredibly in-depth report on the current state and future of last mile delivery. If you are a logistics and supply chain professional, I highly recommend you read the entire report – it provides truly valuable insights. I’ve written extensively about how we are seeing the increasing demands of consumers impacting the supply chain. This report by McKinsey fully supports that hypothesis. The report shows that new business models focusing on faster delivery options are being driven by the new expectations of modern consumers. The key takeaway from the report is that last mile delivery is seeing an incredible amount of disruption, just like every industry. This means that incumbents are being put in a position in which they must innovate or die. We’re also seeing that last mile delivery innovation is growing a significantly higher rate in developing markets. China, USA, and Germany currently make up 40% of the parcel delivery market. These markets are seeing a growth of 7-10% on a yearly basis. While impressive, it pales in comparison to the growth seen in emerging markets. The developing world is showing signs of incredible growth for last mile delivery, especially in the parcel delivery sector. As opposed to the 10% growth in more mature markets, the emerging markets are seeing a 100% growth rate. These markets include India, which is seeing some increasing competition from players like Amazon which is making a land grab to not only open up eCommerce, but own the last mile as well. In an increasingly competitive environment businesses, especially incumbents, need to find new areas to establish advantage. One such area that has emerged as a result of changing expectations is the quality (or perceived quality) of deliveries. The report shows that the variety of delivery options, as well as their perceived quality, is a major decision-making criteria for online consumers. This new reality directly affects eCommerce businesses and their potential success in the marketplace. Though we don’t quite see drones buzzing over head yet, their ubiquitous presence is inevitable. One of the most impressive findings of this report is that in just a few short years we’ll be seeing nearly 80% of deliveries being made by autonomous vehicles.